Walnut trees are well known for growing into large elegant trees. However many modern varieties have been bred to produce more compact trees. The introduction of these smaller varieties has made growing walnut trees possible in all but the smallest of gardens. In addition unlike walnut trees of the past, modern varieties have been bred to bear nuts from a very young age. The varieties that we supply are also self-fertile, which means that you can have a single tree on its own. Walnut trees can be grown in most of the UK but the quality of the nuts produced is much better in the warmer south. However our summers, even in the south, are not hot enough to produce nuts with sufficient oil content to be suitable for drying like the dried walnuts you can buy. 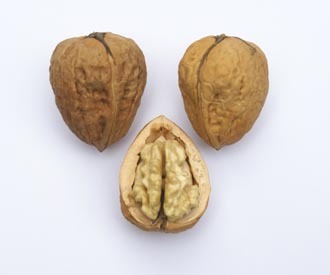 The nuts should be eaten as fresh or “wet” walnuts soon after harvesting. For those who are unfamiliar with wet walnuts, they are a real delicacy usually only available in season from the most exclusive shops. You can grow your own walnut tree and enjoy this tasty and nutritious delicacy from your own garden. 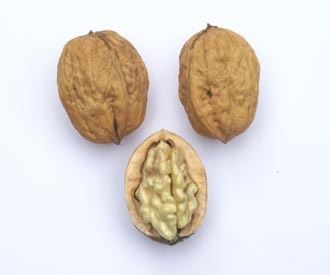 Click here for a guide to choosing walnut trees.